Westside Montessori School was founded in Houston, Texas in the Spring of 1977 by a small, but energetic, group of parents in the Memorial area. Their goal was to establish a parent cooperative affiliated with the American Montessori Society. It was an exciting, at times overwhelming, project; but the growth of the school from idea to reality was rapid and vigorous and on September 6, 1977, our first group of children began the unique experience of a Montessori education. From 1977 to August 1984 the school was located in the Town and Country Village shopping area. In August 1984 we moved to South Dairy Ashford and expanded to four classrooms. In 1994 an Elementary classroom was added. In December 1996 Westside purchased a three-acre site on Briar Forest Drive, just west of Eldridge. Construction of a new, permanent facility for Westside began in November 1997 and we relocated to our new home in April 1998. Expansion at our present location began in the fall of 2001. In March 2002 WMS grew to 12,000 square feet with the addition of the gym and the east wing. WMS has grown to three Toddler classrooms, Four primary classrooms, two Lower Elementary classrooms, and four After-School programs. In 2004 WMS purchased the land just to the east of the school for future development. 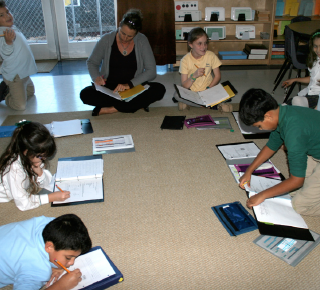 In September 2012 the Upper Elementary building was opened for 4th through 6th-grade students. In August 2013 the new Lower Elementary building was completed and now houses two Lower Elementary classrooms, an auditorium, a multi-purpose room, and parent meeting rooms. Today Westside Montessori students enjoy a beautiful wooded four-acre campus with shaded play areas surrounding the buildings. The dedicated staff, the quality programs, and the committed parents all help to make the Westside Montessori Difference. Westside Montessori School – creating a safe and healthy space for physical and natural education. Student tuition and fees are dedicated to the delivery of quality education programs. Costs associated with any capital expansion or special projects are met through annual programs run by our Parent Co-operative Fundraising Committee with generous support from those involved with the school and others in the West Houston community. We are pleased to be a federally recognized non-profit organization. Past projects have included shade canopies for the play areas, a pond habitat, an orchard, shade trees, a sports court, outside drinking fountains, a covered departure area, and solar shades for the south windows.